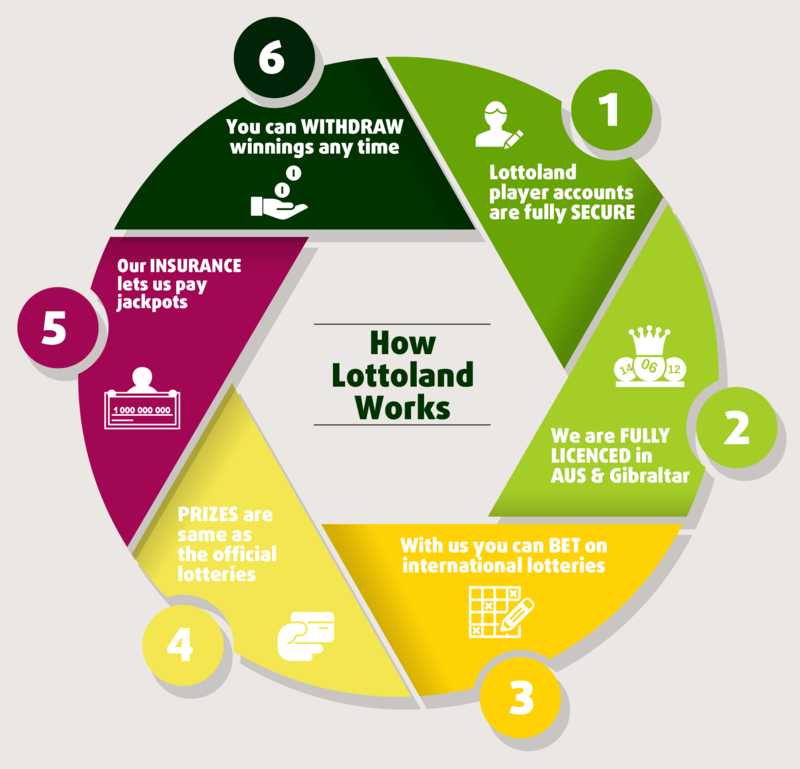 With so many new punters across Australia registering at Lottoland, we thought it was high time to clearly spell out exactly how Lottoland works, especially our prices and prizes and what to expect if you win. Here are the answers to some of the most common questions that we get asked here at Lottoland. Hopefully these answers will help you to understand a little bit more about how betting at Lottoland works. Q. HAS ANYONE EVER WON AT LOTTOLAND? Here in Australia we have over 700,000 players who bet with us. Since we started, we have paid out over $29 million in prizes to winners! On the 4th July 2017, we had our first Aussie Millionaire – a 56-year-old Grandma from Melbourne who won $1.3 million from a $5 bet by successfully matching five from five main numbers on MegaMillions. Not long after this occurred, we also had a mother-of-nine take home $808,000! Coincidentally, it was also a MegaMillions bet! You can read these winners stories and more in our Lottoland Winners section. Lottoland's ongoing support to the Royal Flying Doctor Service: This includes donations of $50,000 for the sponsorship of the 'Lottoland Million Dollar Mitchell Street Mile' and most recently a pledge of $20,000 from Lottoland's #LottolandDance4Charity competition. Last year, Lottoland also offered up the sponsorship of the Manly Sea Eagles jersey to help raise awareness for the RFDS. Lottoland is committed to continuing this ongoing partnership. Mark Hughes Foundation: In 2017, former NRL stalwart Steve Menzies and team Lottoland conquered Everest. The Sea Eagles legend and his team completed the monumental 5500m trek to help raise money and awareness for the Mark Hughes Foundation, a not-for-profit organisation in search of a cure for brain cancer. Lottoland was proud to sponsor such a great cause and are hopes the donation given to the Mark Hughes Foundation can help further support the research and possible cure for brain cancer. Lottoland Mitchell Street Million Dollar Mile: The contribution saw Lottoland offer a $1 million prize to the winner of both the Men’s Elite and Women’s Elite races, should their winning time be an official world mile record. Despite no-one taking home the $1 million prize, Lottoland still donated a total of $50,000 to help support the Royal Flying Doctor Service. Manly Sea Eagles Sponsorship: Lottoland's partnership with the Manly Sea Eagles will help the much-loved club re-invest in its infrastructure and ensure that it continues its 70-year tradition of playing home games in front of its adoring local Northern Beaches supporters. Sydney Swans Sponsorship: Lottoland aims to support the local community and is extremely proud to sponsor the Sydney Swans. Lottoland offers people in Australia the chance to bet on a wide range of international jackpots. The most important thing to remember with Lottoland is that you are not buying official lottery tickets and Lottoland is not affiliated with the official lottery providers in any way. Rather, you are placing a “bet” on the outcome of financial markets. For Lottoland bettors this closely replicates buying an official paper ticket but there are a few important distinctions and common questions which we will address below. At Lottoland you bet on the outcome of the official draw, based on exactly the same prizes as the official lottery. Lottoland is able to pay out any wins, large or small, and the proceeds can then be withdrawn by you whenever you wish. For smaller prize tier payments we make the payment directly from the fund we have from the total sales for the draw. For us to make the larger prize tier payments we take out insurance policies to cover the eventuality of a Jackpot win or a substantial payout on your bet. Part of the Lotto bet price you pay goes towards the payment of this insurance policy. This means that we can pay out no matter how big the lottery jackpot win. Q. HOW CAN LOTTOLAND PAY OUT JACKPOTS WORTH OVER $1 BILLION? The majority of prizes at Lottoland are paid out of our profits as a normal part of business operations. However, when jackpots begin growing into hundreds of millions of dollars we employ major insurance companies to pay out such a large amount of money if a Lottolander wins. Lottoland has also appointed KPMG as the external auditor of their financial statements while PwC are responsible for verifying that all payments are made to winners. Being licensed in Australia means that we have to abide by a number of strictly controlled rules, including those which relate to the security of everyone who uses Lottoland. All personal data - including payment details - will be processed to the highest safety standards at Lottoland. Lottoland.com.au itself gets only the last four digits of your card number to see, while the full details are stored by our payment service provider Adyen. Adyen must undergo stringent tests by Visa and MasterCard to be certified in accordance with PCI DSS and so to be able to handle the payments annually. All transactions are securely encrypted and we take your privacy very seriously. This is essential in order to protect you, the customer, as well as to ensure we are fully compliant with all relevant government regulations. All transactions are completed using a secure SSL connection, just like banks do. All Lottoland prizes, including jackpots, are fully underwritten by leading global insurance companies. Q. DO I PAY TAXES ON MY WINNINGS IN AUSTRALIA? You do not pay any taxes on your winnings in Australia because winnings from gambling are not taxable. Additionally, for European lotteries like EuroMillionaire and EuroJackpot you will be paid the full amount as a lump sum as most European countries don’t tax gambling winnings. The main exception to this European rule is the Spanish Xmas Lottery and El Gordo Primativa where your winnings would be less 20% as gambling winnings are taxed in Spain, and you will receive the same amount that a Spanish winner would get after tax.